Any man’s death diminishes me, more so when that man is one of our own. Since we began in 2002 there have been several reports of old boys dying. Some were personal friends, some were those that we hadn’t seen or heard of in many years. Some we never even knew. But none of them was one of us. Our school contained several hundred boys at any one time so no surprise that many good and bad stories exist. The social media that was Friends Reunited sparked a forum that we latched on to and have used for our enjoyment ever since. The Internet may have a lot to answer for, but it has made such things easier and possible for us. Group emails circulated that told tales of little victories and of defeats, large and small. Anecdotes of wry humour, stories of comeuppance. They were all there. Some alluded to knowledge of secrets that will never see the light of day, and why should they? The passing years would never make them easier. No, what we shared was the common bond of childhood into young men. And then you got the wild tales of one Peter Stechman, known to all as ‘Stech’. Just one ’T’ in the name, James, wrote he, telling me off for writing ‘Stetch. Sorry mate, I did not check my facts. Stech’s alter ego wrote emails like no other; wild, outrageous, hilarious, defamatory [to many of us who had to take it on the chin] and sometimes serious. We did have one or two conversations about what he could or should not write! The man knew the Islington of our youth. He knew the people who lived there. He married his childhood sweetheart and they had two daughters. He was honest, generous, well-travelled and the fittest of us all. Ironic, that last comment. A lot of us walked around with paunches of various sizes, while he swam and danced and exercised! He was slim and well-built. He wrote blogs on the gigs he went to, always telling us how the women would fall over themselves to dance with him as he was such a good mover. He made it clear though, that he always went home to his dear wife, letting us know that he was only allowed out with her permission. The times he asked me to meet him at some venue or other, and me, always refusing. Wish I’d gone now. He made it clear in several early emails that none of us knew how long we had left and that we should get out and enjoy ourselves as much as we could. How prescient was that? Stech died on Tuesday 9th August and those that knew him, will most certainly miss him. No man is an island. 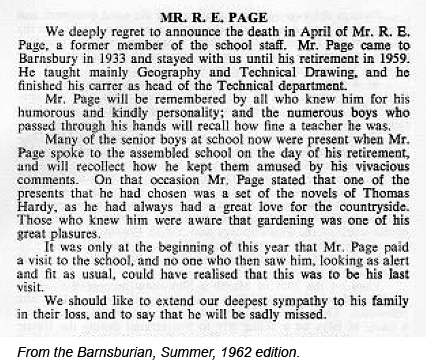 This page recognises staff members and former students of Barnsbury School for Boys who have passed away. Known to one and all as "Dodgy". Born: January, 1946, in Islington. Married: March quarter, 1966, to Susan J. Warren, Islington. Died: October 15, 2010, at home: 17459 Nth 31st Avenue. Phoenix, Arizona 85053, USA. Updated information supplied by Norman's sister, Vivien Downton-Spaul in December, 2018. Kenneth John Edwards and former Barnsburian, passed away three years ago (2012) still living in Islington just off New North Road. Ken started at the 'old college of knowledge' same year as me, 1959, and left in 1964 to join the Royal Navy where he served for 24 years, 22 of those on Polaris submarines. Ken retired from the Navy as a Charge Chief Petty Officer (SM), now known as Warrant Officer 2nd Class. He was in charge of the navigation systems of the sub and highly skilled. On leaving the Navy, he drove a cab in and around Dunfirmline until returning south and found a job in electronics. Sadly, at around 62 years of age, Ken developed an inoperable brain tumour and after a short period passed away. He has a daughter and son living in Plymouth from his first marriage and another daughter by a subsequent marriage living in Scotland. Known to one and all as "Dickey". Believed to be part of the 1957 school intake. We would be most grateful if anyone can shed further light on this. 13th May, 1947 – 9th August, 2016. Known to one and all as "Stech". Sometime around April 2011, Peter “Stech” Stechman coined the phrase, “Good Old Barnsbury Boys”, and the official abbreviation – GOBB – was born. For many years, Stech was part of the glue that kept the former Barnsbury School for Boys alumni together in a virtual and actual existence. A natural athlete, Stech excelled in sports; especially swimming, and possessed a strong physique. Jive dancing was his speciality and he knew all the best venues and bands. His hidden strength of a vivid, accurate and imaginative gift for expressing memoirs, jokes and storytelling entertained the GOBBs over the Internet as we looked back over our lives and, in particular, the “good old days” at school. Peter is survived by Wendy, his wife of almost 50 years, and his two daughters, Jill and Jane. 16th April 1948 - 29th November, 2017. In later life, John worked for the Sun Life Assurance Co. of Canada. He married Anne, who survives him, together with many friends and family. John and Anne retired to Wadebridge, a civil parish and town in north Cornwall. John became ill on the 27th November, 2017, and passed away on the 29th. In a significant gesture of sympathy, there were many email messages sent by Good Old Barnsbury Boys offering their condolences to John’s family. 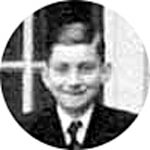 After leaving Barnsbury Boys School, David moved to Ropsley in Lincolnshire with his parents where they retired after selling their confectionary business in Kings Cross. David worked for a local agricultural machinery manufacturer, but after a year or so being somewhat unimpressed with the possibilities of country life, he joined the Royal Engineers and became a blacksmith. Upon leaving the Royal Engineers after serving with the BOAR in Germany, he married Susan and worked at Elstree Forge, a business that he took over and ran till he retired. They had several homes after retirement one of which had belonged to the notorious Kray twins, though they probably didn’t realise this when they purchased it. They then moved to Cambridgeshire about 2008. Unfortunately, David suffered a fatal aortal rupture at home five years later. A Barnsbury boy from 1955 to 1960, and entered forms 1/2/3 Alpha. Mick graduated with two GCE ‘O’ level passes in 1960. Living in Hornsey Road, Mick stayed close to a few Old Boys over the years until his unfortunate death in 1993 as a result of mesothelioma. He was 49. He married Anita in 1965, and had two sons. Mick took over his father’s very successful electrical business in Hornsey Road, and then moved to Broxbourne in Hertfordshire. Born in Islington, it was natural that the first football club to which Keith Weller, who died of cancer aged 58, would be attached was Arsenal. But they let the Barnsbury schoolboy player slip away to rivals Tottenham Hotspur, whom he joined in 1964 as a winger. During his three years there Weller never gained a regular place. It was only when he moved across London to Millwall, where he was converted into an inside-forward, that he showed his true talents. At 5ft 10in, building up gradually to a solid 12st, Weller showed fluency, skill and intelligence, scoring 41 goals in 135 games. In May 1970, he joined his third London club, Chelsea, for what was then the substantial fee of £100,000. But he never really settled at Stamford Bridge, and it was when, in September 1971, he moved again, for another £100,000, to Leicester City, that he fully emerged. He would play there, successfully and influentially, till 1979, eventually moving, as veteran British players tended to in those days, to America. There he joined the Fort Lauderdale Strikers, and, subsequently, a string of other professional clubs, as player or coach. Weller's England career was brief, but by no means undistinguished. It took place in the interregnum which followed the dismissal as England manager of Sir Alf Ramsey. In May 1974, the job went temporarily to Joe Mercer, once a distinguished England left-half himself. In the space of one month, May 1974, he called on Weller four times, using him in all three home international matches, and a friendly against Argentina at Wembley. ​Keith was married with two daughters. E. J. W. ("Bill") Bayliss. 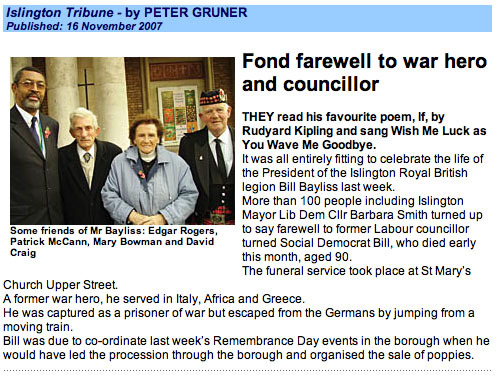 Maths teacher at Barnsbury Secondary School for Boys: died on October 26th, 2007, aged 90. 24th October, 1945 - 30th June, 2014. Out of the blue I received an email from Louise Jane Godfrey the daughter of John Godfrey telling me that he had died suddenly. Having traced me through our website, she thought that we might like a copy of John’s Form 4T photo (with names attached) for posterity. I wrote back offering all our condolences and thanking her for the photo; it was one of our missing ones. I reciprocated by sending her a photo of John from the Laycock school journey to the Isle of Wight in 1957. Sorry to hear about John's death. He was lead trumpeter in the school band, and a good player. Also, am I dreaming, but was he in Mungo Jerry? Perhaps others can put me right. There was a 'John Godfrey' who played guitar in Mungo Jerry. Sorry to hear about one of our GOBB'S passing away. Thanks for sending our condolences. Wasn’t this the boy who played Bass in fatty Baldwins band that backed George Bean at the school dance? Correct on all counts. He was a year in front of me in the band. First trumpet alongside Peter Hayward. He played bass with George Bean & the Runners with Ray Baldwin on lead guitar. Played bass with Mungo Jerry but not sure after that. Johnny G left in '62 I believe. Peter Hayward stayed on as 1st trumpet, I played 2nd. I know Keith Morgan and Chris Bunting were also in the band then. I have a photo of the band somewhere, if I find it I’ll forward it on. Sad when you hear of a contemporary leaving the party early. RIP J G.
Mention is made of Georgie Bean (presumably the metalwork master). Didn't realise he was into pop - I remember he had a son Chris (I think) who was a pop "star". Georgie Bean anecdote. Various people having a smoke in the ground floor toilets at Camden Road opposite the gym during break time. Georgie walks in, completely ignores smoke, says "so this is the place where the knobs hang out; come on, outside you go." Another master would have sent us to the Bonk for smoking. George was one of the better, more human masters. John. Georges son was also called George. So it was George Bean junior and the Runners. Believe it or not he had a good voice and looks. He made a couple of records, probably Elvis-type covers. I believe he died young. Me and Billy Pitt-Jones used old George’s metalwork shop as a route to bunk off in the afternoons. Happy days. Sorry to read the sad news of John Godfrey's passing. I knew him from the usual neighbourhood kids' intermingling and when he attended Laycock J.M. School. Thanks for sharing the BBS form 4T photo, which will be included on our website with the rest of the class pictures. I have attached a photo showing John with his classmates on the 1957 Isle of Wight school journey. If Louise hasn't seen it, please forward the image to her. Thanks, too, for sending the message of condolence. January 2016 Just received this email from Alan French. I just had to write to you about a book I am reading - 'Birth to Reunion' The Pieces of Mind story by John ( Ducksy ) Reardon (Wales ). John Reardon is a guitarist who helped form a band called Pieces of Mind. I have just this minute read in this book that a bass player in one of his bands was our own 'John Godfrey ' the author saying, "sadly John passed away in 2014". Brian was born in Camden Town and was always into technology and building things, whether it was Meccano, amateur radio, astronomy or chemistry. He decided to learn the guitar, and built his own Fender lookalike, which by all accounts was a very good one. Brian met Gina in 1966 at a church youth centre in Camden Square, and they married in 1968. Also in the 1960s, Brian joined the GPO as part of the Post Office Telecommunications branch (now known as BT) as an apprentice. After finishing his apprenticeship, he worked for the telex and radio interference department where he was tasked to locate and close down pirate radio stations all over the West End and Westminster areas of London. It was his love of radio that he became a qualified teacher of Morse and amateur radio. Towards the end of the 1970s, Brian moved departments, and his new role meant working closely with the Ministry of Defence and the Metropolitan Police. He was sent all over the world on product approvals for trading systems. After retirement, Brian set up his repair business, including his speciality, Marshall amplifiers. As singers/bands still used this old type of technology, he was soon in demand. This would mean visiting such stars as Jay Kay or advising the late Amy Winehouse on her studio set up. Outside of work he loved astronomy, and very much enjoyed being at Hampstead observatory with his friends, going on camping jaunts around the country, and was actively involved with the British Amateur Astronomical Association. Comradeship and brotherhood was very important to Brian, and joining the Masons meant much to him. He treated everyone the same whether it was King Hussein of Jordan, or learning basic sign language just to speak to a couple who used the same local restaurant. Barry was a respected Barnsbury boy, who graduated with four GCE ‘O’ level passes in 1960. In 1959, he was appointed a 5th Year Prefect. In the same year, he became involved with the school rugby teams, and wrote several reports and articles that were published in The Barnsburian school magazine. A fine example is his report on the visit of the school rugby team to Wales in the 1960 Summer edition. Following is the intro-duction of a typical report written by him. ​Later in life, Barry’s flair for writing enabled him to author two local history books: The Northwood Book, and The Northwood Book Volume II. During the two seasons that the school team has been playing, there has been a noticeable and marked improvement in the standard of play and sportsmanship. This standard is now higher than ever, and the players more eager and keen to uphold the school's name. There is now a wide choice of players from which to choose a good team; whereas at the start of the first season that the team ever indulged in, to gather fifteen boys outside the school on a Saturday morning took Mr. Bone a great deal of tact and some gentle persuasion. However, the game has caught on and Barnsbury now runs four teams; these are drawn from the fifth and sixth years of the senior school to the second year of the junior school. I can only comment, however, on the senior team (the 'under sixteens'), as this is the team to which I devote most of my time. It is a team of wide and varied characters, ranging from diplomatic-like Gates to bull-like Michaelides. Photo appears in form 3 Alpha, Eden Grove, 1956. Form master: Mr. Hinchcliffe. Photo appears in 5th form, Eden Grove, 1956. Form master: Mr. Page. C. S. ("Bunny") Warren. 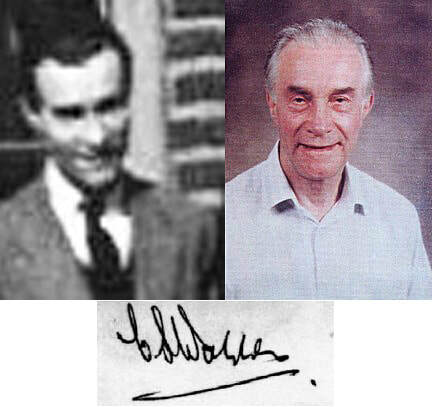 Art and Science/Biology teacher at Barnsbury Secondary School for Boys from 1951 to 1955. On 20th. February 1992, Stanley Warren passed away at his home in Bridport, at the age of seventy-five. Stanley Warren was a Far East POW, held in camps in Singapore for the duration of his captivity. In summer 1942, a few months into captivity at Changi POW camp, he was recovering from a debilitating bout of dysentery when one of the army padres, knowing Warren was a trained artist, asked if he would help to decorate the little chapel that the POW had created on the ground floor of the hospital block. St Luke's chapel's murals, known as the Changi murals.